To localize specific cellular structures, OriGene Technologies offers a selection of antibodies useful as marker tools for organelles. Here, we focus on our antibody panel to proteins significant for the endoplasmic reticulum (ER). This organelle can be found in all eukaryotic cells and is constituted as a specialized interconnected network of tubules, vesicles and cisternae. This network is the location for protein translation, protein folding and the transport of proteins. The three dimensional structure of many extracellular proteins is stabilized by the formation of disulphide bonds. It is suggested that the PDI is involved in disulphide-bond formation and isomerization, as well as the reduction of disulphide bonds in proteins. The highly conserved sequence Lys-Asp-Glu-Leu (KDEL) is present at the carboxy-terminus of PDI and other soluble ER resident proteins including the 78 and 94 kDa glucose regulated proteins (GRP78 and GRP94). The presence of carboxy-terminal KDEL appears to be necessary for ER retention and sufficient to reduce the secretion of proteins from the ER mediated by a KDEL receptor. PDI is commonly used as a ER marker. The HSP 70 family comprises four highly conserved proteins, HSP70, HSC70, GRP75 and GRP78. They act as molecular chaperones facilitating the assembly of multi-protein complexes, participate in the translocation of polypeptides across cell membranes and to the nucleus, and aid in the proper folding of nascent polypeptide chains. GRP78 is localized in the endoplasmic reticulum, where it receives imported secretory proteins and is involved in the folding and translocation of nascent peptide chains. It is suggested that members of the HSP 70 family act as force-generating motors, relying on the hydrolysis of ATP for their activity. 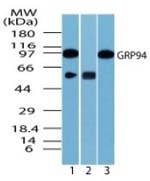 GRP94 is an ER resident molecular chaperone, which is a paralog of cyto-plasmic HSP90. It assists in the folding of membrane-bound proteins including the Toll-like receptors, certain subclasses of integrins and some secreted proteins such as IgG. For GRP58, it is reported that the gene encodes a 505-amino acid protein which shares significant homology with the molecular chaperone protein PDI. The ERp57 sequence was also shown to include a putative nuclear localization motif and an ER retention motif. ERp57 functions together with calnexin and calreticulin as a molecular chaperone of glycoprotein biosynthesis within the ER. 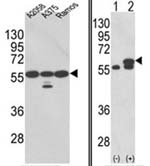 ERp29 is a 259-residue protein that is closely related to the chaperone proteins PDI, GRP94 and BiP. It appears to be up regulated during ER stress conditions. This soluble protein is localized in the lumen of the ER in all mammalian cells. There are two primary domains within ERp29. The first domain is the C-terminal region that is most likely involved with ERp29 retention to the ER. The second is the N-terminal region that resembles that of PDIs thioredoxin module. Calnexin and calreticulin (calregulin) are calcium-binding proteins that are localized to the ER. Calnexin is localized to the membrane and calreticulin in the lumen. They play a key role in glycoprotein folding and its control within the ER, by interacting with folding intermediates via their monoglycosylated glycans. Calnexin (IP90, p88, p90) is a 90kDa chaperone. It consists of a large 50kDa N-terminal calcium-binding luminal domain, a single transmembrane helix and a short acidic cytoplasmic tail. Unlike its ER counterparts with KDEL sequences on their C-terminus to ensure ER retention, calnexin has positively charged cytosolic residues that do the same. The protein has also been shown to associate with the MHC complex class I heavy chains, partial complexes of the T-cell receptor and B-cell membrane immunoglobulin. disease, complete congenital heart block, and halothane hepatitis has been suggested. This lumen protein can be used to measure the intactness of membrane preparations and can be used as a marker for subcellular fractionation of cells. Cytochrome p450 enzymes (CYP) are divided into two groups: steroido-genic and xenobiotic. The latter group is comprised of the families 1, 2 and 3. The xenobiotic p450s are involved in most oxidative drug metabolism. Studies suggest that all known drug metabolism is mediated by family members: CYP3A, CYP2D6, CYP1A2, CYP2C9/10, CYP2C19 and CYP2E1.